Sclerosing encapsulating peritonitis (SEP) is an infrequent cause of intestinal obstruction in adults. SEP was first observed by Owtschinnikow in 1907 and was called peritonitis chronica fibrosa incapsulata. In SEP, there is a total or partial encapsulation of the small bowel by a fibrocollagenous cocoon-like opaque membrane. SEP can be primary or secondary. The primary (or idiopathic) form, also known as the abdominal cocoon, was first described by Foo et al. in 1978, and the etiology remains obscure. Secondary SEP, which is more common, can be triggered by peritoneal dialysis, use of beta-blockers, abdominal trauma/surgery, ventriculoperitoneal shunt, peritoneal tuberculosis, sarcoidosis, systemic lupus erythematosus, gastrointestinal malignancy, liver cirrhosis, etc. SEP as a cause of small bowel obstruction accounts for 0.4%–4% cases of small bowel obstruction seen in surgical practice., Endometriosis is rarely encountered as a cause of SEP. Preoperative diagnosis requires a high index of clinical suspicion combined with appropriate imaging findings. Surgical treatment is the gold standard management strategy of SEP. We report a female patient diagnosed with SEP and extensive endometriosis along with massive hemoserous ascites. A 38-year-old nulliparous female presented to the emergency department of our hospital, with complaints of severe abdominal pain, abdominal distension, and bilious vomiting of 4 days duration (May 2017). There was no history of melena, constipation, loss of weight, loss of appetite, fever, or jaundice. Her menstrual history was significant for dysmenorrhea, dyspareunia, and postcoital bleeding. She was married for 13 years and was on treatment for primary infertility in the Department of Obstetrics and Gynecology where she was investigated to have grade 4 endometriosis. She became symptomatic after a laparoscopy for infertility evaluation in 2008 following which she developed frequent episodes of abdominal distension and ascites which required recurrent paracentesis, once every 5–6 months. In 2011, analysis of paracentesis fluid showed elevated adenosine deaminase (ADA) level, for which she was put on antituberculous treatment (ATT) for 6 months. Repeat ADA level after 6 months was normal, and ATT was stopped. In 2016, she had presented to the emergency department with features of subacute intestinal obstruction. Plain X-ray of the abdomen showed multiple air-fluid levels [Figure 1]. Computerized tomography scan of the abdomen revealed large intraperitoneal fluid collections in the anterior aspect of bilateral hypochondrial regions, bilateral lumbar regions, and umbilical region displacing the bowel loops and adjacent organs posteriorly, suggesting loculated ascites. Uniform thickening of the peritoneum was noted. The ovary was bulky with multiple cystic spaces; a possibility of endometriotic cyst was given. She underwent exploratory laparotomy, during which approximately 1 L of chocolate-colored fluid was drained from peritoneal cavity and a fibrous covering was found to be encasing the bowel. Omental and peritoneal biopsies were taken for histopathological examination which showed fibrocollagenous tissue with dense collection of neutrophils, lymphocytes, plasma cells, histiocytes, and numerous congested vessels. No endometriotic glands, stroma, or granuloma was noted. In the present admission, her routine hematological and biochemical investigations were within normal limits and a second laparotomy was performed (May 2017), during which 2 L of chocolate-colored fluid was drained and thick fibrous tissue encasing the bowel was noted with cocoon formation of intraperitoneal small and large bowel segments. Appendix was found to be adherent to cocoon which in turn was adherent to the lower abdominal wall [Figure 2]. Appendicectomy was done, and biopsy from the fibrous covering of the cocoon was taken. Appendix and biopsied cocoon sac showed histopathological evidence of endometriosis (endometrial glands and stroma) and congestion [Figure 3] and [Figure 4]. The cocoon layer showed extensive sclerosis and chronic inflammation too. Ascitic fluid culture was negative. On the postoperative day 4, her obstructive symptoms worsened, and she was started on leuprolide acetate (depot preparation) following which there was symptomatic improvement. After 1 week, she again developed obstructive symptoms and an ultrasonogram showed a large collection with internal echoes in the peritoneal cavity with dilated small bowel loops and edematous prominent mesentery and omentum in right iliac fossa. An ultrasonogram-guided pigtail insertion was done and 500 mL of chocolate-colored fluid was drained from the peritoneal cavity. However, subsequently, the patient developed sepsis and multiorgan dysfunction and expired in spite of all resuscitative attempts. SEP is a rare cause of acute or subacute intestinal obstruction in adults. Preoperative diagnosis is difficult and requires a high index of suspicion supported by clinical data associated with appropriate imaging findings. The diagnosis is usually made at laparotomy which reveals gross thickening of peritoneum with partial or total encasement of bowel loops by thick fibrocollagenous, cocoon-like membrane. The entity is categorized into three types according to the extent of the encasing membrane: (1) Type 1 – the membrane encapsulates partial intestine; (2) Type 2 – the entire intestine gets encapsulated by the membrane; and (3) Type 3 – the entire intestine and other organs (e.g., appendix, cecum, ascending colon, and ovary) are encapsulated by the membrane. Primary (idiopathic) SEP, also known as abdominal cocoon, occurs mainly in young women from tropical and subtropical zones. The pathogenesis is obscure, but many hypotheses have been proposed which include retrograde menstruation with superimposed viral infection and retrograde peritonitis via the Fallopian tube More Detailss. However, as SEP develops in men, premenopausal women, and children, these theories are not well accepted. In some, congenital hypoplasia of greater omentum is proposed as a predisposing cause of SEP. In SEP associated with peritoneal dialysis, a two-hit theory explains the pathogenesis, in which the first hit is caused by chronic exposure to bioincompatible dialysate, resulting in mesothelial disruption and fibrosis, and subsequent exposure to a second insult such as peritonitis and acute cessation of dialysis/transplantation triggers the development of SEP. Secondary SEP is more common than idiopathic form (abdominal cocoon) and is reported from different regions of the world. Various causes attributed to secondary SEP include the use of beta-blockers, peritoneal dialysis, abdominal trauma or surgery, ventriculoperitoneal shunt, peritoneal tuberculosis, sarcoidosis, systemic lupus erythematosus, gastrointestinal malignancy, and liver cirrhosis. Rarer causes include endometriosis, dermoid cyst rupture, luteinized ovarian thecoma, and cytomegalovirus peritonitis., In this case, histopathology confirmed the etiology as endometriosis. 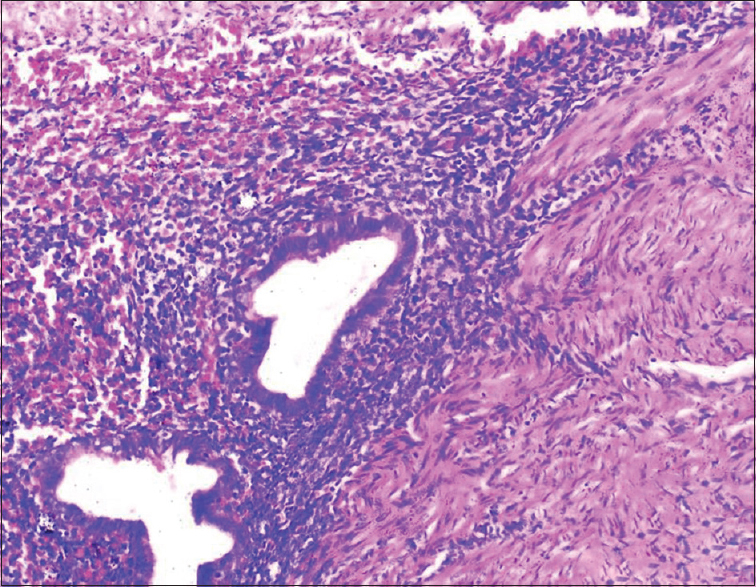 The histopathological features in SEP include the proliferation of fibroconnective tissue in the peritoneum, inflammatory infiltrates, and dilated lymphatics (without any evidence of foreign body granulomas, giant cells, or birefringent material). “Sclerosing” implies the progressive formation of sheets of dense collagenous tissue, “encapsulating” denotes the sheath of new fibrous tissue that covers and constricts the bowel and restricts its motility, and “peritonitis” refers to an ongoing inflammatory process and the presence of a mononuclear inflammatory infiltrate within the new fibrous tissue. In their review, Moinuddin et al. 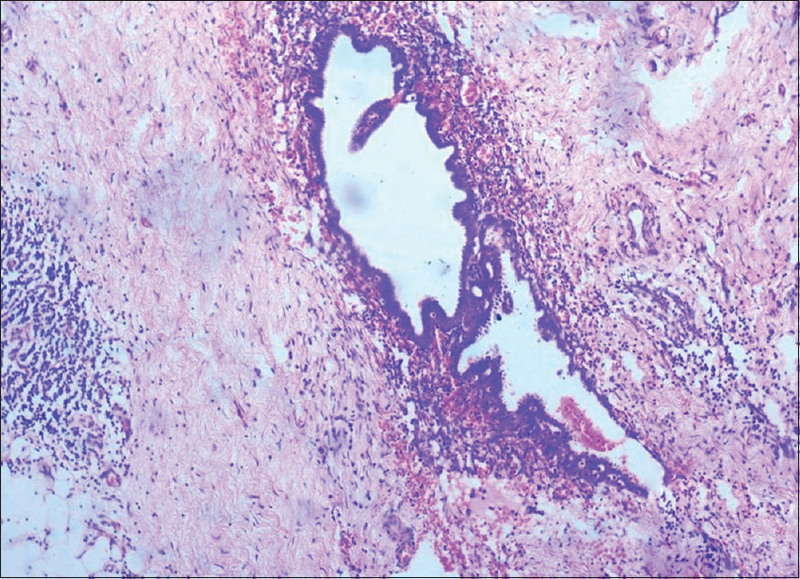 described important histological findings of SEP as thickening of the submesothelial cell layer, vasculopathy, arterial occlusion, inflammation, tissue and arterial calcification, and ossification and also a positive immunohistochemical staining for podoplanin by peritoneal mesothelial cells. Medial sclerosis and hyalinization of the peritoneal vasculature (vasculopathy) are seen along with neoangiogenesis in SEP associated with long-term peritoneal dialysis. These histopathological findings combined with the characteristic surgical and imaging findings are helpful in the diagnosis of SEP.
Surgical treatment options include subtotal excision of the membrane, adhesiolysis, small bowel intubation, bowel resection, and exploratory laparotomy. Careful excision of the thick sac with release of the small intestine loops without resection is the treatment of choice, when feasible. SEP associated with endometriosis is a rare entity, and Gonadotropin-releasing hormone (GnRH) analog treatment is advocated for at least 1 year in the postoperative period. Tannoury JN, Abboud BN. Idiopathic sclerosing encapsulating peritonitis: Abdominal cocoon. World J Gastroenterol 2012;18:1999-2004. Seng LK, Mahadaven M, Musa A. Abdominal cocoon: A report of two cases. Br J Surg 1993;80:1149. Foo KT, Ng KC, Rauff A, Foong WC, Sinniah R. Unusual small intestinal obstruction in adolescent girls: The abdominal cocoon. Br J Surg 1978;65:427-30. Tombak MC, Apaydin FD, Colak T, Duce MN, Balci Y, Yazici M, et al. 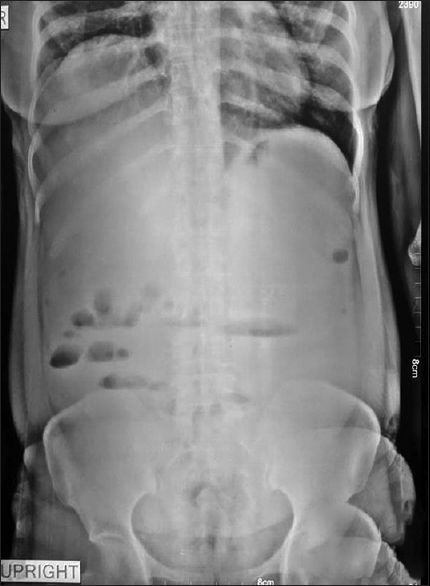 An unusual cause of intestinal obstruction: Abdominal cocoon. AJR Am J Roentgenol 2010;194:W176-8. Cai J, Wang Y, Xuan Z, Hering J, Helton S, Espat NJ, et al. 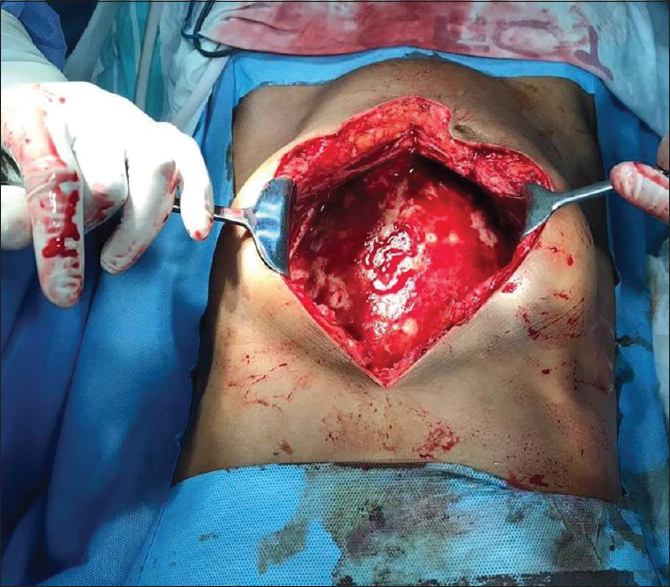 The abdominal cocoon: A rare cause of intestinal obstruction in two patients. Am Surg 2007;73:1133-5. Santos VM, Barbosa ER Jr., Lima SH, Porto AS. Abdominal cocoon associated with endometriosis. Singapore Med J 2007;48:e240-2. Mohd Noor NH, Zaki NM, Kaur G, Naik VR, Zakaria AZ. Abdominal cocoon in association with adenomyosis and leiomyomata of the uterus and endometriotic cyst: Unusual presentation. Malays J Med Sci 2004;11:81-5. Moinuddin Z, Summers A, Van Dellen D, Augustine T, Herrick SE. Encapsulating peritoneal sclerosis-a rare but devastating peritoneal disease. Front Physiol 2014;5:470. Akbulut S. Accurate definition and management of idiopathic sclerosing encapsulating peritonitis. World J Gastroenterol 2015;21:675-87.